I don't seem to have a solid light blue wire coming from the factory radio harness? The metra kit its a blue wire. So the pink and black wire coming from that harness sends a 12v remote signal to the amp? Or is it a remote signal from ignition source for the headunit? Brilliant! Thank you for your help and being patient with me. I'll update once I've soldered it up. Pink/Black wire from the stereo harness needed wiring up to an ignition source and it did indeed remote turn-on the OEM Bose Headunit. I'm getting my new Pioneer AVH-X3600BHS head unit installed next Monday, It's being done by the guys at Best Buy (not myself) so I'm pretty confident everything should work fine... my question is how would I reset the display bar clock once I lose those factory buttons??? Last edited by batsupsidedown; 06-23-2014 at 02:43 PM. Took 2 seconds. Page 9. You're welcome DH. Been beating my head against a wall for the last few days. Anyway here's the issue. My 2004 RX8 keyless entry stopped working out of nowhere, I've tried the reset programming with my old remote after changing the remote battery. That didn't work. I bought a new remote and tried programming it as well and that failed. The process seems like it works, the car opens and closes the door and what not but doesn't allow to program. Is there a way to reset the alarm? Is there a fuse somewhere that I'm missing? Is there something I'm not considering? I had that exact problem and had no luck fixing it. I talked with a Mazda dealer and he said the cost of troubleshooting and replacement of alarm computer would cost well more than $1000.00. I opted for after market alarm, which had all the features of the OEM along with many other usefull features. Cost was $300.00. One being a knocking noise in my drivers suspension/steering when I turn, the second being this. I have a non bose - navigation setup. My lower door speakers aren't working. Any idea where I need to start troubleshooting? I've pulled the head unit and everything is good there. Thanks in advance! I Purchased the 95-7510 kit and i was wondering if your know any touch screen aftermarket radio that would fit flush with the kit and use the steering wheel controls? b.t.w this is my first time buying a rx8 and joining the club. Any double din will fit. Most any decent double din will come with a steering wheel control input jack/wire (sometimes called "wired remote"). Use the Axxess ASWC or iDatalink Maestro SW to get your steering wheel controls to work. I have a 2006 RX-8 with Bose 6-CD changer. The firmware is 10.01. Is there any product out there that will provide iPod/iPhone integration and also Bluetooth hands-free calling? Sorry for rehashing up this thread, but the links on the first page for how to remove the headunit do not seem to work and am hoping you have updated links for those. I'm trying to find a picture walkthrough of removal so I can install the AUX adapter through the antenna cable output. Unless you know this already... can I yank the antenna and plug the new cable in by going from under the CD player without having to actually remove it? Many cars have built in amplifiers that require a 12v signal to be sent in order to turn on the Amplifier, most common being Bose, Infinity, and JBL. 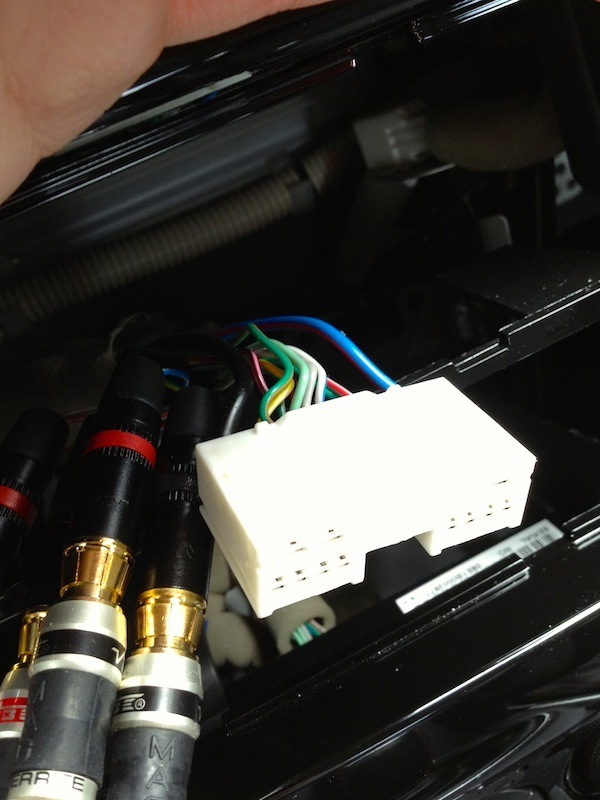 If your car has any of these systems, check your AMP TURNON signal wire for 12v. Blue/White wire located on Head Unit wire harness. Worked like a champ. It drove me nuts trying to figure out why there was power to the head unit but no sound, but it never occurred to me that the factory Bose amps needed power. Oh well, lesson learned. Bose Amp working but not front speakers. Hello everyone. I connected a tablet to use as my head unit, to the rca cables connected to the Bose amplifier but music is only playing from the back speakers. How would I get music to play from both front and rear speakers? The Bose amplifier does not have RCA connections. Please give us detail on how you connected to the Bose amp, or, what someone else may have done to the amp before you got to it. And please start your own topic versus posted in the FAQ thread.